The art collective Kinobox Obscura brings its 3D camera obscura paddle wheel boat – the first of its kind in the world – to this year’s Pixelache festival. The artists pedal the paddle wheel catamaran and give the audience free boat rides for 2-3 people at a time. For the first time ever people will have a chance to see an upside-down “3D movie” on waters. The world outside the boat cabin is seen on a silver screen in 3D when wearing RealD 3D-glasses. The boat is equipped with custom-cut lenses (two lenses, one for eah eye) and circular polarized filters. The viewers can change the image focus by adjusting the lenses by two handles. The boat has been built using recycled materials wherever possible. The deck is made out of old fire hoses from Helsinki Fire Department, the cabin is covered with silverish metal sheets from an offset printing house and the door handles have been modified from old Lapinlahti hospital bed railings. And like all Kinobox Obscura artworks also the 3D camera obscura boat works without any electricity. The boat with no name (yet) has been built this summer and spring in the Kinobox docks in Lapinlahti, which will also house the Pixelache festival this year. The boat launch party was organized in co-operation with Pixelache festival in the beginning of July and after that the boat has been seeing sailing (or rather pedal-paddle-wheeling) in art festivals in Latvia and Estonia. But now the time has come for the boat and the Kinobox Obscura crew to return to their home harbour in Lapinlahti bay. The Kinobox Obscura cruises will be available every festival day when the weather conditions are good enough. If it’s too stormy or too dark for the camera obscura to operate the boat will stay anchored – but no worries – there’s still a chance to experience the camera obscura in 3D. Just hop on the KO Silvershadow Mark 2 – the 3D camera obscura bike rides will be also available on the festival grounds! 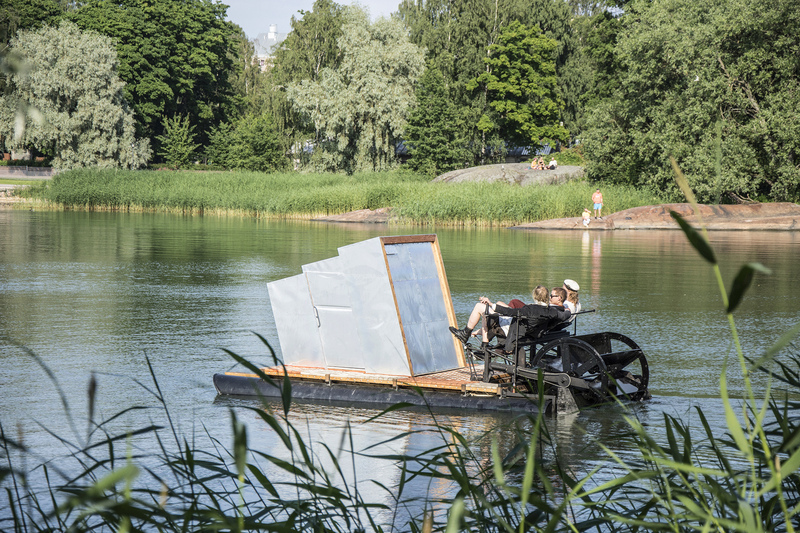 The building of the first 3D camera obscura boat was funded by the Arts Promotion Centre Finland and Kone Foundation grants. Baltic Lifejackets Sweden provides lifejackets in all sizes to secure safe 3D voyages. The art collective Kinobox Obscura is known for inventing the first 3D camera obscuras in the world. Since 2013 the artists have been building houses out of old 35 mm movie transport cases (trademark Kinobox) in Finland and Estonia. In 2014 the team took part in “Parallax – Geographical Resonances” exhibition in Mexico, where they built a 3D camera obscura house out of local movie boxes and also the first mobile 3D camera obscura – KO Silvershadow the bike. The members of Kinobox Obscura crew Juho Poesiloe Pöysti, Risto “CW01” Puurunen, Mika Paunio and Tuomo Vuoteenoma have a long history in making art in its different forms: be it music, fine arts or performance art.